Having both a distillery and a brewery under your flag means a lot of experimentation. On the one hand, different styles of beer can be distilled on the spot. On the other, there’s a ready supply of barrels to age all those stouts and IPAs. Few brands know this better than Oregon-based Rogue, famous for its Dead Guy Ale and, more recently, its gins and American malt whiskeys. One of its most recent additions, Rolling Thunder Stouted Whiskey, is a spirit that never gets too comfortable in one place. 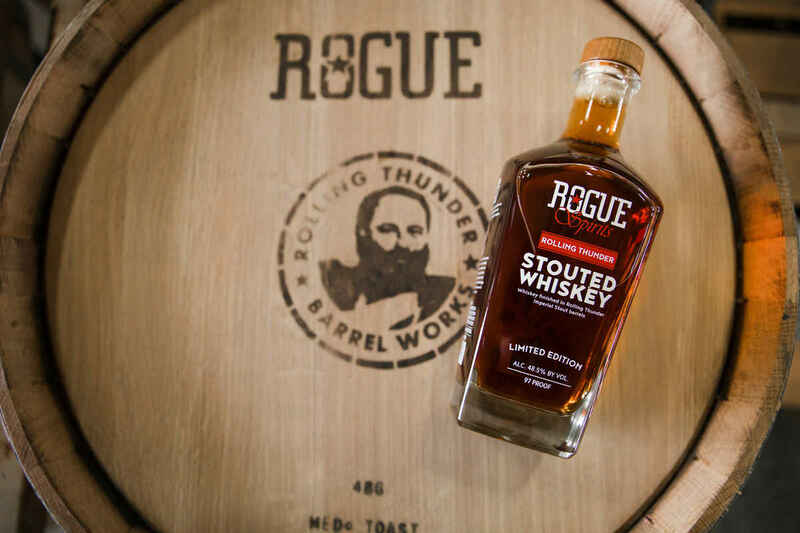 It starts its life as the malt-heavy Dead Guy Ale before it’s distilled and aged for a year in a new Oregon oak barrel from Rogue’s own on-site barrel-making operation. The whiskey is then transferred out, and the empty barrel gets filled with beer—Rolling Thunder Imperial Stout. After nine months, the spirit goes back into the original barrel for another two years. I’m tired just thinking about the manual labor involved. Anyway, on the nose is a big whiff of sea brine, malt, a bit of mocha from the stout, and even a coconut-banana character. It hits your tongue with a hit of candied fruit and toffee, before a long, lingering finish of coffee, leather and black pepper. It’s good.